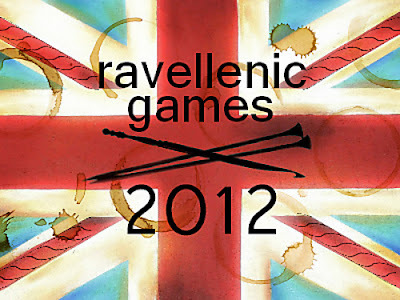 The Olympic Games are almost upon us and to get in the spirit I am joining the Ravellenic Games hosted by the knitting website Ravelry. Now I am not the biggest sporting follower, however this seems like a great excuse to sit and watch the games whilst being productive. I have signed up for the WIP Wrestling which is for projects that are in progress but have not been touched since at least May 15th. I stopped knitting it in about April when the weather started getting cooler and I switched to another more wintery project, but now with the Ravellenic Games I am inspired to finish it off, plus it will be getting warm again soon. I only need to do all the rib for the top of the sleeves, sew it together and block it. It really shouldn’t take that long (she says hopefully). If I finish quickly I am tempted to enter the Mitten Medley too. I have never knitted gloves or mittens, but am certainly keen to give them a go. Aren’t all Olympians supposed to “aim high”? The Mass Cast On begins at the Opening Ceremonies on Friday, July 27th. For me, that means I should be casting on at 6:00am on Saturday morning, however there is no way I am getting up at that time of morning to knit, lucky my first project for the games is a WIP that already cast on! Are you an olympic crafter too? Hadn't thought of doing it, but have definitely owed my mama a pair of socks for about three months…they're currently languishing half-finished in a pile somewhere. Maybe I should take advantage of this and get that sorted.That sweater's lovely, by the way! OOh that's a lovely jumper! And you're so nearly there with it.